There are hundreds (probably thousands) of Emergency Preparedness products available out there. Some products are critical to have, while others just make life easier. Below you will find a few of our hand chosen products we love for Emergency Preparedness. We started selling these items so that we could get our readers the best prices possible on them so that they can enjoy them too! In the last post in this series we’ll show you some of the products we love to use daily to cook with our Food Storage in our regular lives. In an extended emergency with no power, and pounds and pounds of wheat, you’ll need a good hand grinder to make use of your wheat. The Wonder Jr is a fantastic mill that can grind all sorts of grains and by simply swapping the stone heads for the stainless steel burr heads you can make delicious peanut butter or other nut butters, grind flax or any oily or wet grains, grind herbs and spices, and even coffee or soy beans. One of the things that really intimidated us about even getting started with food storage was the idea of powerless cooking. When we discovered Sun Ovens we were thrilled with the possibilities. Anything you can cook in a regular oven can be cooked in a Sun Oven and usually turns out even better! Without having to worry about storing a fuel source, Sun Ovens are the perfect tool for a long term powerless emergency. InstaFire is a safe, simple, and versatile new fire starting product. It has water-repellant properties, a fifteen minute burn time and a thirty year shelf life. Use it to light campfires, prepare charcoal briquettes, or as a safe and reliable fuel source for cooking or heating in emergency situations. In an emergency you will most likely need to boil water, cook your food, and heat your shelter. Fuel discs are another great option for fuel storage. They are made of cedar and are idea for use in small stoves for starting a fire or heating and cooking food. They can be extinguished and relit and are safe to store indoors. You can also get a free cube stove with purchase of a 108 pack bundle of fuel discs! While most good filtration systems use a ceramic filter which gets out most of the contaminants in water, you still need to purify it afterwards to get out all of the viruses. The Black Berkey Purification Elements are unique filters in that they remove viruses, harmful pathogenic bacteria, cysts and parasites as well as unhealthy chemical contaminates and impurities while leaving in the essential minerals your body needs. Water Bricks have a unique stacking capability that allows you to store them in virtually any configuration. From small nooks and crannies to large storage rooms or even outside, these containers will fit your needs. When we first saw Water Bricks we knew they could be a GREAT option for people who are struggling with space issues, or who are looking for an easy to carry, light-weight, portable water storage solution. 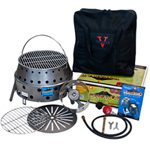 The Volcano Grill is a great stove that gives you all sorts of cooking options. We love them because they work with a variety of fuels, and cook with pots and pans, grills, woks, or dutch ovens. We use ours for camping, eprep, and just for fun! The Prepare My Life Planner is an organized emergency preparedness plan. Not only does it contain a step-by-step plan to help prepare your home and family for an emergency, it is also designed to store and organize your important documents. All of the pages, pockets, pouches, and folders are included. Whether it’s a natural disaster or a death in the family, every household needs a plan in order to survive, cope, and recover.